Dropping five pounds can make a difference to your health. Those small fluctuations in weight could be doing you harm. So before you brush off that snug waistband, you should know that a small increase in weight is bad for your blood pressure. Why those few extra points raise your blood pressure? Chronic stress can push blood pressure numbers up into danger territory, but according to the American Heart Association (AHA), your weight also plays a big role. Along these lines, new research from the Mayo Clinic has found that as few as five extra pounds can spike your blood pressure, even if you are otherwise healthy. This is something you’ll want to keep in mind the next time you go on vacation – when we’re more likely to eat more of the not-so-healthy types of food. “This is an important finding because a five to seven pound weight gain may be normal for many during the holiday season, the first year of college, or even while on vacation,” study lead author Naima Covassin said. The study was presented at the AHA’s High Blood Pressure Research Scientific Sessions 2014. Covassin’s team began by testing the blood pressure of 16 healthy adults between the ages of 18 and 48. Over the study duration of eight weeks, those adults ate an extra 400 to 1,200 calories daily, adding in a chocolate bar, an energy drink, or an ice cream shake every day. The goal was to increase their weight by about five percent. At the same time, another 10 healthy adults maintained their weight for the study period. Eight weeks later, the researchers repeated the blood pressure test. They found those who gained weight during those two months had an average increase in systolic blood pressure from 114 mm Hg to 118 mm Hg. Their blood sugar levels, insulin, and cholesterol didn’t change. As well, the study participants who gained more weight around their abdomen had higher average increases in blood pressure. Weight is certainly an important factor when it comes to our health. Even slight weight gains have been the focus of numerous studies. Abdominal fat has been linked to metabolic disturbances and plays a key role in a variety of health problems. Harvard reports that just a few extra pounds can lead to an increased risk of cardiovascular disease and diabetes. It has been tied to increased breast cancer risk for women, along with an increased need for gallbladder surgery. 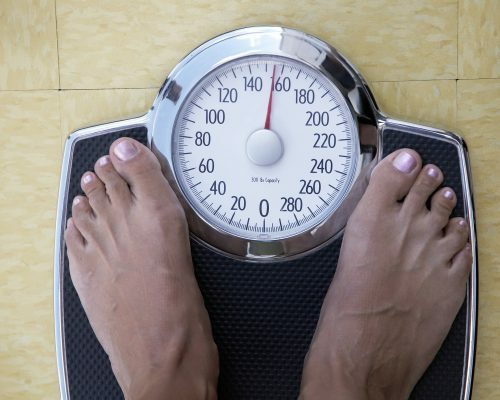 Losing weight may seem like a daunting task, especially if you are older, but here are some words of advice, which can help you drop those extra five pounds. Hanging onto extra weight, even a few pounds, is bad for your blood pressure and your overall health, too.